Get set for a sizzling Valentine’s Day with Creamline! With just over a week to go, Valentine’s Day is an important day in the calendar for many! As one of the most popular dishes for the 14th February, cooking up a good steak at home is one of the preferred ways to celebrate. To help get your date night sorted, we’re offering a fantastic deal on a range of sizzling steaks, served with a choice of premium sauces. The cuts have all been locally sourced and expertly prepared by Little Pigs butchers, so you can be sure that your steak will be a showstopper. Let the steak come to room temperature – this will help avoid any charring on the outside, and too much redness in the middle. Turn the steak every minute or so, to make sure it is cooked evenly – around 6 minutes for medium-rare. Try salting your meat generously ahead of cooking – this will result in a more evenly seasoned steak, as the meat will have had time to absorb the salt. Make sure the pan is very hot – this will sear and caramelise the outside of the meat. Let the steak rest in a warm place for a few minutes after cooking. 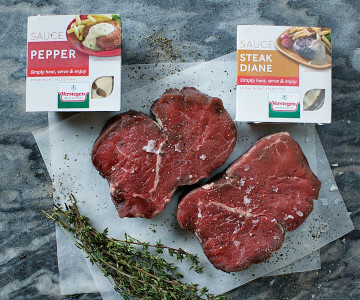 Choose rump, sirloin or fillet from our Valentine’s range, complete with a choice of delicious sauces including Diane and peppercorn. To round off, the artisan cheesemongers at Cheshire Cheese Co have created a unique Champagne, Strawberry and Cream Cheese Truckle, combining creamy flavours with tart strawberry. Perfect for afters! Have a browse of our Valentine’s Treats here.